Foreign investment has been a principal engine of global economic growth in recent years. Foreign investment, though, is not immune to the sort of resistance that we are seeing with respect to the movement of goods and services. Indeed, just as with trade, calls to restrict investment are growing louder in many countries, with potentially significant adverse political and economic consequences. In this Council Special Report, David M. Marchick and Matthew J. 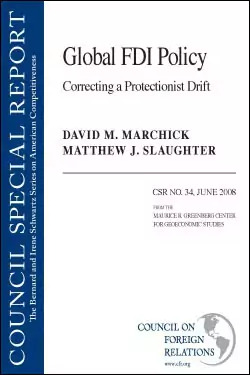 Slaughter track the rise of investment protectionism. They examine trends in a number of countries, documenting moves toward restricting investment through both legislation and regulation. They also analyze the reasons behind these trends, such as increased concern over investment from “nontraditional” sources, both private and sovereign wealth funds. The report ends with recommendations for policymakers. Acknowledging governments’ legitimate national security interests, it lays out clear principles for host countries to follow in regulating foreign investment. The authors also recommend actions to be taken by international organizations to help foster sound policies in these host countries. The result is a compelling analysis and a strong case for governments everywhere to take steps to maintain openness to investment. Part of the Bernard and Irene Schwartz Series on American Competitiveness.